we're here to develop existing ideas or create new ones. our fresh approach and experience ensures our designs remain current, relevant and competitive. 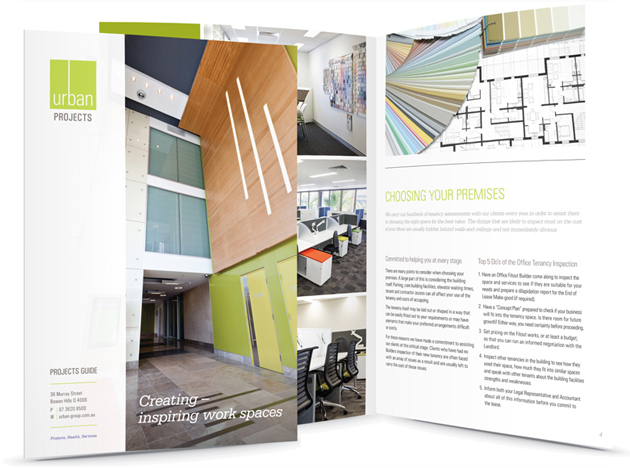 whether it's a new brochure or a whole advertising campaign, we'll create impressive marketing collateral with our unique graphic designs. Urban provides commercial fitouts & furniture for businesses and health professionals, along with maintenance services for building owners and managers. With the expansion of the company they required support to reasses the brand and accompanying materials. Easemail worked with Urban to redesign their brand, website, stationery, marketing collateral and a variety of other print materials. The result was a professional brand which represented the company and its evolved direction. 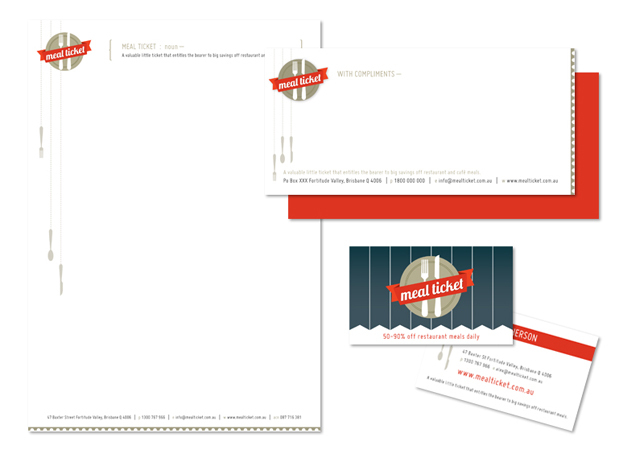 Australian Institute of Psychology (AIP) approached Easemail to develop their brand and marketing material. We created a brand, website, stationery, study materials and continue to design their marketing collateral. The result was a professional, friendly and credible brand that was easily adaptable across a range of mediums and contexts. 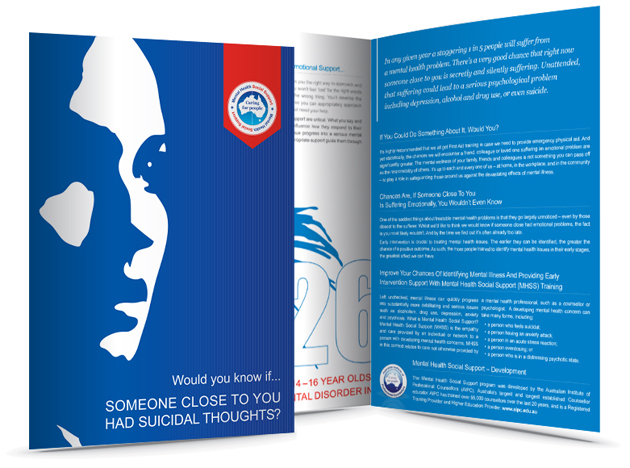 A press campaign was developed for The Australian Institute of Professional Counsellors to advertise their courses and associated programs in an industry journal. The campaign was released at the end of winter and as such a bright and fresh colour scheme was used to create a clean and appealing look for the start of Spring. The campaign was a success, it was informative, maintained the individual branding elements yet recognisable as a group. The Life Coaching Institute (LCI) run regular promotions for their courses. 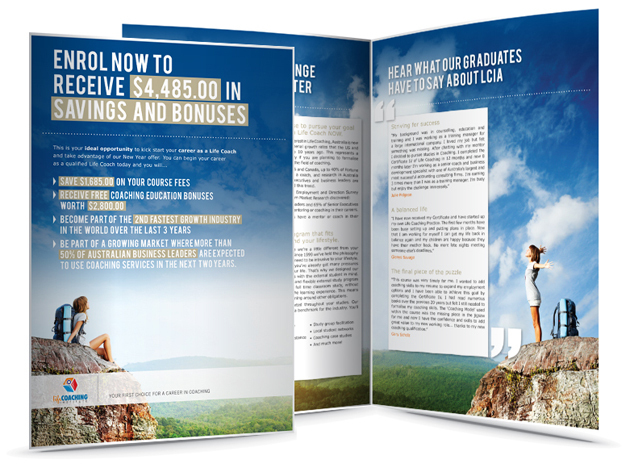 These promotional brochures are sent to thousands of ongoing enquires they receive from all across Australia. They needed an eye-catching design to get people's attention and make them aware of the great offers available. We teamed up with Mental Health Social Support (MHSS) to design their branding, website, stationery, student workbooks and a variety of marketing collateral. The bold, contrasting graphics are eye-catching and help to send a strong message about a serious topic. A group buying site focusing their attention to the restaurant market, Meal Ticket required a brand to be developed to reflect this. We created a look and feel which suited the food industry. Its fresh colours, contemporary vintage look and fun imagery allowed for a great transfer across numerous print, online and email campaigns. 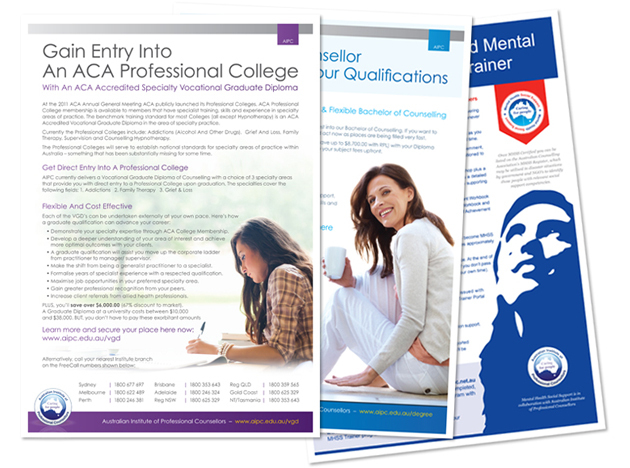 We've developed a strong relationship with The Australian Institute of Professional Counsellors (AIPC) and continue to work with them to create fresh solutions for their regular promotional flyers, student workbooks, study guides, course prospectus, press advertising and more.